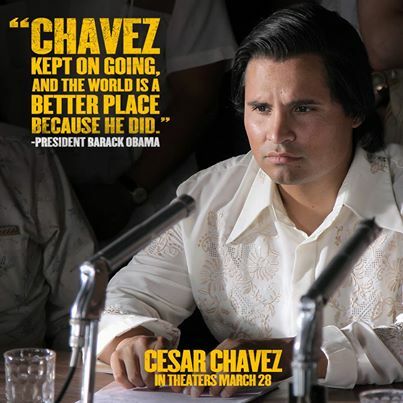 "Cesar Chavez" Opens This Weekend! Click here for Washington-area show-times and tickets this weekend. Director Diego Luna’s new film shows Chavez battling generations of injustice and mistreatment in the fields by leading farm workers in the historic 1965-1970 Delano Grape Strike. It portrays Filipino and Latino workers joining together in solidarity on the same picket lines where they endured violence from growers. It highlights how Chavez was the first to apply boycotts to large-scale disputes between employers and unions. And it concludes with farm workers winning the first union contracts in agriculture after five years of relentless struggle and sacrifice. Cesar Chavez – which is rated PG-13 -- stars Michael Pena as Chavez, America Ferrera as Chavez’s wife, Helen, Rosario Dawson as Dolores Huerta and John Malkovich as the patriarch of a huge grape-growing empire. From the beginning of the movie, Chavez makes it clear that only with a union can farm workers overcome the abuse and poverty that plagues their lives. It is a message that is as relevant today as during the events of the 1960s that the film chronicles. Another way to honor Cesar Chavez is to sign the on-line petition asking President Obama to proclaim a national day of service on Chavez’s March 31 birthday—so people can honor the heroic union leader by engaging in meaningful public service where they live.